From Monday 20 – Thursday 23 July you can train for 21/2 hours each morning and afternoon, over the four days, allowing 10 hours intensive training, each morning and afternoon, working on 2 separate disciplines (1 each from A and B) for 5 hours per day in total. These choices are divided into sections – A & B, please select one from each category. 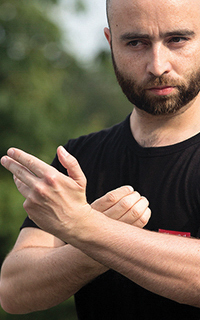 During the week our aim is to reinforce your practice by bringing together your tai chi form, qigong and pushing hands, we will look at how they interweave and compliment each other allowing a deeper understanding and study of your tai chi. The sessions will be challenging and have an emphasis on solo, partner and group work. 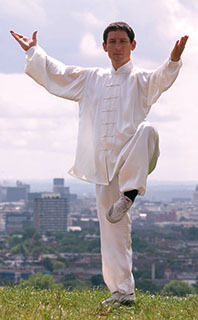 Whether you are a beginner or an old-hat at tai chi you will come away with a fresh look at Tai Chi. When Qi flows unobstructed through our body, our emotions and our mind, a stream of healing energy arises which we can apply to self-healing. We will use elements from Wudang Hui Chun Qigong to develop this skill, applying basic exercises to develop our personal Qi. 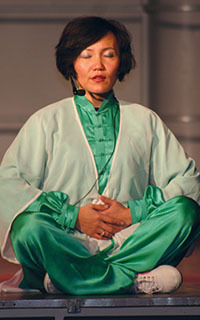 We’ll share qigong partner-work for training energy-awareness and special breathing techniques to release negative Qi and help to open the Greater Heavenly Cycle. Yin/Yang and the Five Elements are the domains to develop our healing power. The 13 Step Tai Chi Form includes the basics for the study, of all aspects of tai chi such as timing, balance, structure and movement awareness in forms and practice research and applications. 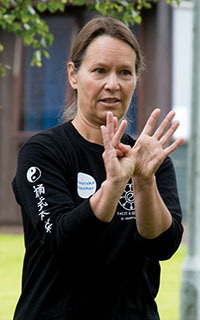 In these sessions will work on both solo and partner routines to develop a deeper sense of good tai chi practice. One to one lessons for participants – advice to personal practice. For beginners as well as advanced. Relaxation is an essential basic principle for correct Taiji practice. Over the course of the week, by means of solo and partner work (Tui Shou and Conditioning exercises) we will work to develop deeper experience of this fundamental principle. Accessible to all. Tuina is a perfect complement to those who train in Martial Arts or have in interest in massage. We’ll study basic principles and key techniques with an emphasis on developing internal work and Qigong to prepare the body and mind. We will develop sensitivity through the correct practice of Tuina and its application in Push Hands. For beginners and those interested in deepening their martial practice as well as for practitioners of other Internal or Healing Arts. From the ancient traditional sitting Dao Yin Exercises, these first appeared in Shou Shi Chuan Zhen edited by Xu Wenbi in the period of Qianlong in the Qing Dynasty. Recently modernised and refined by the Health Qigong Research Team of Beijing Sports University, the set combines traditional Daoist meditation, massage, Daoyin stretching, and exercises for the meridians, facial area, head, shoulders, chest, back, waist and lower limbs. Participants should bring a cushion a mat, towel, or a low chair/stool for this workshop. Accessible to all. Don’t Talk, Do It: Pushing Hands – Judith van Drooge (B3) Keep it simple easy and comfortable, filling up the shape. Let the energy flow, when your heart knows, let the body follow. Is the body loose, soft enough to gain the speed you need. Is what you do practical? When it works continue otherwise find another way. 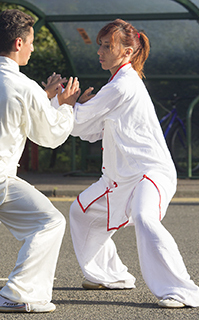 Starting from basic movement principles we will work through solo and partner drills and exercises to improve fundamental Taijiquan skills like rooting, unifying, connecting, spiraling, hardness and softness and so on. The idea behind these workshops is to get a solid feel for these practical concepts and to be able to work on them in solo practice as well as partner applications. From dedicated beginner to advanced practitioner. We will enjoy safely-structured, gentle contact drills and games to explore how the principles of Taiji may apply to sword fencing. 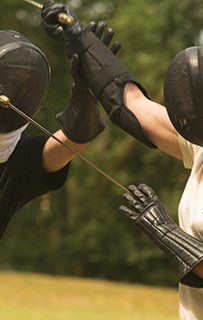 This workshop will primarily focus on blade perceptiveness. 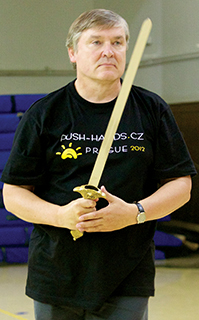 Accessible to any Taiji sword practitioner, irrespective of level or style. and find almost all of your post’s to be exactly I’m looking for. Not something we require, thanks.